In 2001, FTP Today became the first company in the world to offer the technology of online managed file transfer via FTP and related protocols. By mid-2008, the FTP Today team committed to putting a significant portion of their annual revenue into creating their own feature-rich FTP server application suite and control panel. Today, they continue to lead the FTP/SFTP hosting industry, while also competing favorably in the broader file-sharing services market. When the FTP Today team approached IMPACT, they were looking to address two distinct challenges. First, their industry space was becoming increasingly competitive. FTP Today went from being one of the first companies to offer online managed file transfer via FTP to one of many. Furthermore, new entrants to the market were enticing their would-be customers with increasingly inexpensive and accessible alternatives, such as Dropbox. Second, FTP Today had a high customer churn rate. (For this client, "customers" include not only paying customers, but also those who have engaged in a free trial.) Through their team's research, they found that many of those who opted into a free trial, but eventually abandoned the product, did so because they found they didn't use the web application often enough to justify it as a line item in their budget. With these two challenges in mind, their goals with inbound marketing were clear. FTP Today needed to increase their online visibility by ranking higher in search results, and grow organic traffic and conversion rates. In addition, they needed to better engage current users, to prevent them from dropping the product entirely. We devised two approaches to be implemented concurrently -- a comprehensive inbound and content marketing strategy, as well as a new customer retention plan. To help FTP Today achieve strong organic traffic and visitor-to-lead conversions, we knew an aggressive content marketing plan was needed. Through competitive keyword research, we determined which terms we wanted to rank for and crafted articles, premium content, and website page content that spoke to those keywords. Jumpstarting FTP Today's strategy by publishing two articles per week, targeting specific keywords identified in our research as terms we wanted to rank for with limited difficulty. Once the initial push phase passed, we moved to publishing one article per week to keep the distribution of high quality of information consistent. Optimizing pre-existing articles to include better information, as well as links to refreshed site pages, new articles, and offers. Updating key SEO elements (meta description, page title, etc.) on landing pages and website pages that received low click-through rates but high impressions in search results. Revising content on landing and thank you pages to encourage better conversion rates. Refreshing high-performing whitepapers to include better information and calls-to-action to nurture leads and encourage them to take subsequent steps and actions. Creating industry-specific content -- including whitepapers, blog articles, and other pieces of premium content -- to capitalize on highly-searched terms. With customer churn rate being a top concern, we knew our ability to devise a strong customer communication and engagement plan would be critical. Although the stated reason for abandonment had to do with lack of use not justifying the cost, we were able to determine that many of FTP Today's customers did not fully utilize the company's software because they didn't understand how to set up their account and use each feature. Additionally, they weren't staying informed on the release of new features. We held monthly workshops for existing customers to answer their most common questions. This provided a platform for FTP Today's founder, Martin Horan, to speak directly to his customers and empower them to use the software in the most efficient way. 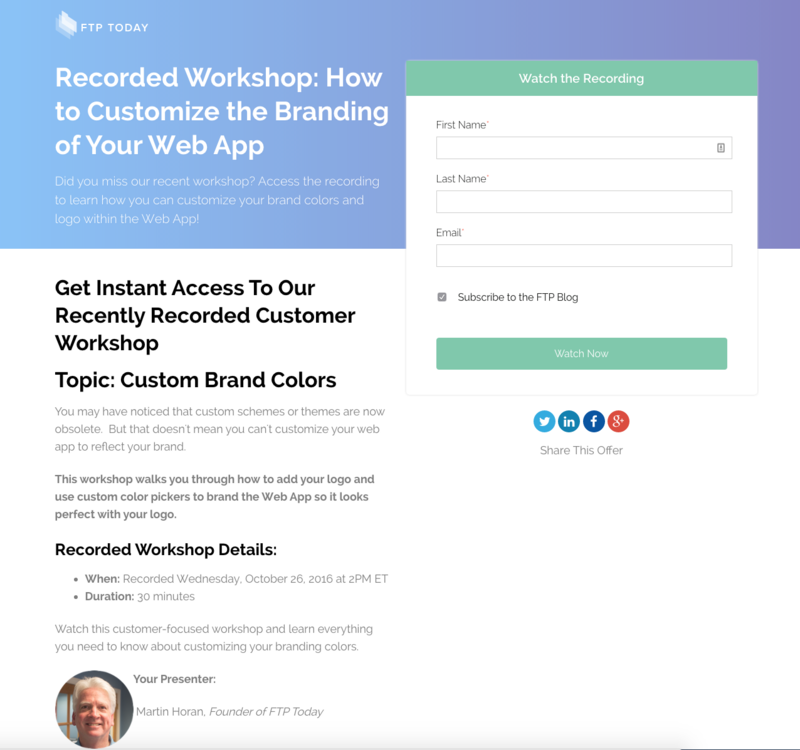 After each workshop, a recording of the session was sent to those who attended, and we updated the workshop's promotional landing page with the recording, allowing future customers to request access to the videos. 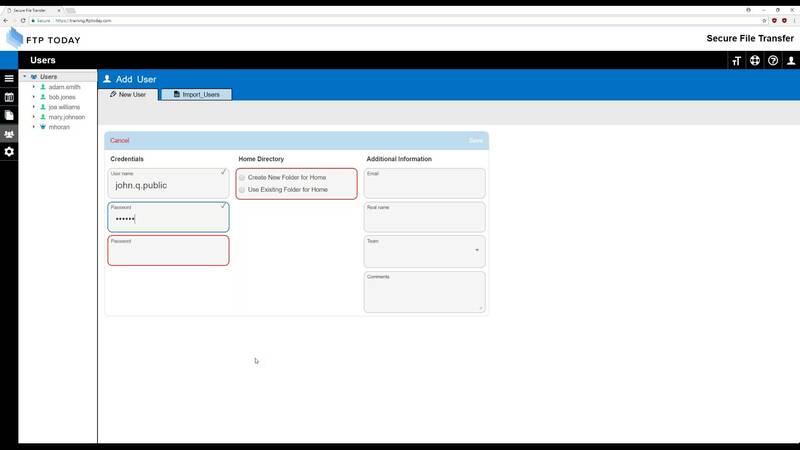 As an added benefit, Horan has also used these recordings during sales calls to show potential customers a behind-the-scenes look at the web app and its functionality. We were also able to generate measurable customer excitement for new releases through these workshops. For instance, a recent workshop centered around a sneak preview of the 3.0 version of their application had a 46% conversion rate, along with a wave of customer requests to be placed in the first round of those to receive those updates. Frustration for customers often arose from the fact that they were in the dark about new software features. So, when something would change, customers were not aware. To get ahead of these updates and changes -- and to ensure customers did not feel blindsided -- we launched a software updates blog for announcements, which automatically fed into the Announcement section of the application's dashboard. We also segmented emails to customers on specific plans to inform them of changes being made or new features being released. Segmented emails were sent to those in specific plans to inform them of additional features they were missing out on that were available in other plans. This enabled Horan to initiate conversations with users about moving them onto larger plans at higher price points. One of the most universal customer pain points was that they don't know how to use the software, beyond opting into their free trial and initial set-up. To solve for this, we created simple, step-by-step training videos without infringing upon Horan's time (as would be the case with one-on-one trainings), as he does not have a sales or customer service team at his disposal. Free trial users are also entered into a workflow to help them stay engaged with messages that include links to those training videos. 269 keywords ranked in Top 10 of Google search results. 124% increase in organic traffic, 2017 over 2016. 216% increase in new contacts from organic traffic, 2017 over 2016. 12.56% contact-to-customer rate from organic traffic. Launched in 2017, the ITAR guide (target audience of military and government) brought in 102 new leads and four new customers. Although it was originally launched in 2015, 76% of new leads that converted on the company's HIPAA guide only did so after the guide itself and the landing page were revised in 2017. The same can be said for their 2015 comparison guide, of which 65% of new leads created were only recorded after the offer was relaunched in late 2016. Organic search traffic growth, all-time. New contacts via organic search. 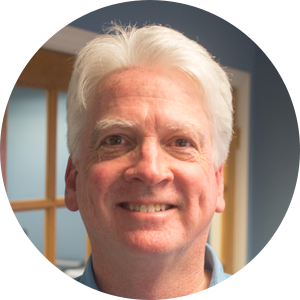 "I chose IMPACT as a partner because I was impressed with their detailed sales process. I have found that they have great systems in place throughout their organization. They run their operation like a well-oiled HubSpot machine. They are quick to change course when necessary, and I definitely feel like I am getting a great value from my investment with IMPACT. Their work is earning compliments -- even from my competitors!" Though the improved website and content performance metrics are worthy of celebration, the most important metric of success for our activities was to have a positive impact on FTP Today's business. As a result of working with IMPACT, FTP Today experienced a 12.7% increase in revenue, from 2016 to 2017, and a 52% decrease in their customer churn rate.